The teeth adjacent to the space are prepared as they would be for crowns. The bridge is effectively a row of crowns connected together in one piece but made to look like individual teeth. 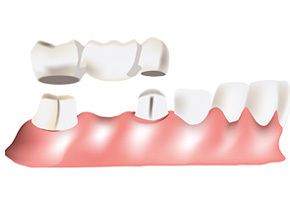 Once the bridge is finished it is bonded on to the prepared teeth permanently to fill the space.